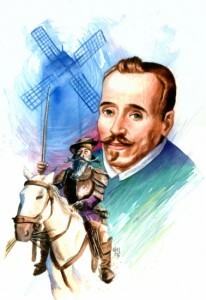 Yesterday was the birthday of Miguel de Cervantes, who has given us Don Quixote. What does this have to do with Twitter? Nothing, it’s a lot more important. You probably noticed that Don Quixote is one of my favorite books, a book you can read a thousand times and still find something new in it each and every time (here is my review). What many people don’t realize is that the first book of Don Quixote (there are two) is a comedy and in my opinion is hilariousness still today. Whether they saw the movie, the show, or never read the book (which is probably most), the idea that Don Quxiote is some tear jerking tragedy is wrong. There certainly is a sad outcome, the second one especially, but the journey is what makes it. Yes, it’s a long read – but what a trip. Why is the ebook edition of J.K. Rowling’s new novel, “The Casual Vacancy,” $17.99?ow.ly/e26zl Why indeed? #Kindle Daily Deal: Two Richard Castle Mystery Novels ow.ly/dYe0h $1.99 each. @Shareaholic don’t like the new version. Doesn’t allow me to edit tweets because of the 140 char limit in the text box.